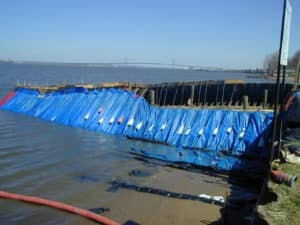 PortadamXL is a proprietary dam system based on OnSite’s successful Portadam temporary damming solution. It has been designed specifically to operate as a free standing structure in and can be deployed in a variety of environments. The structural design and performance has been certified by numerous bodies to enable temporary works certification to be achieved. 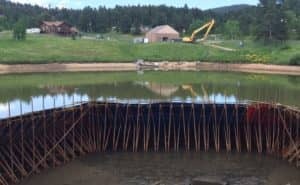 The design transfers hydraulic loading to a near-vertical load; creating a freestanding dam that requires no additional bracing or support. PortadamXL frames are designed for deeper water projects up to 4.5m and are a more economical alternative to sheet piling. Frames over 3m are no longer man-portable and require lifting machinery for installation. These are specialist frames are supplied to specific project requirements. Contact us for further information. The larger frames, due to weight, are no longer man portable and must be positioned using lifting machinery. A dive team will also be required for deep, in-water, installation to ensure that the sealing sheets are positioned correctly. All installations are carried out by OnSite’s experienced and highly trained operatives. 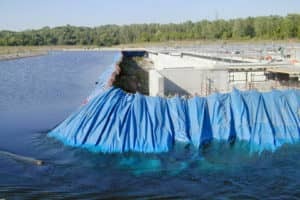 Our training and experience is key to providing an effective temporary dam so that you can confidently place your man-power and equipment in a safe, dry working area. After initial dewatering, there is a 12 hour stand down period before an integrity check is carried out and the dam signed off for safe use. On going monitoring and assessment.